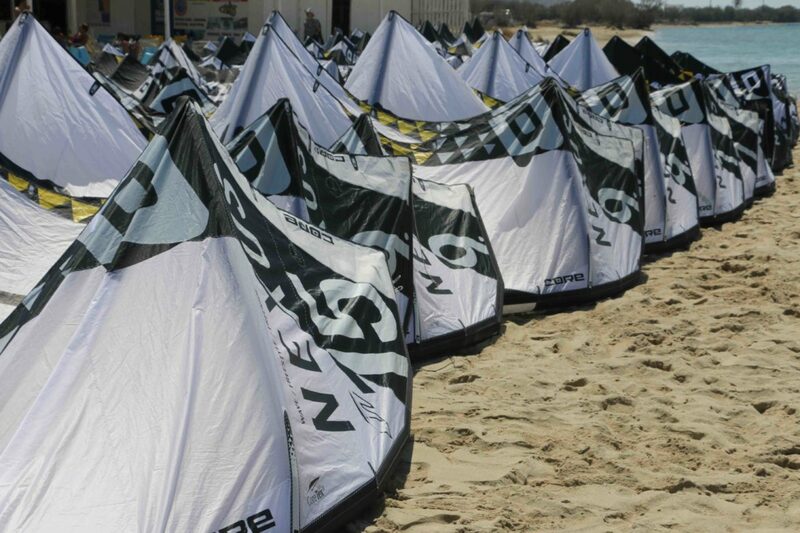 Always want to have the right Kite size? Don’t want to worry about having to buy the latest kite every Year? Want to swap from twintip to directional when the wind is dropping. Our Rental services will make sure that you never have to worry about your setup. Equipment Rentals are offered with material of the major Kiteboarding Brands in the market. Core Kiteboarding gear, North Kiteboarding and Cabrinha are making sure that you always get the latest and most advanced equipment to enjoy your session at Pounda Kiteboarding Beach. Our Kite Pool holds over 80 Kites of all sizes and shapes. All control bars are checked on a daily basis on proper functionality of safety systems. Kiteboards of all kinds, Twintips, Directionals and Hydrofoil Boards are offered for independent Kiteboarders. All rentals include Harness, Wetsuit, Life-Vest and Helmet. Choose the right Rental Package for you! kite and board rental include rescue service. Material is not sharable. Package includes Twintip Board! Kite and Board rental include rescue service. Package includes Twintip board! Hydrofoil board rental includes rescue service! Only available to independent Hydrofoil riders! Hydrofoil rental include rescue service. Material is not shareable! Kite and Board rental include rescue service. Useable over several days in min. 1 hour sessions! Interested in our Material Rentals?